Chemistry starts and ends with chemicals. There are different chemicals used in different processes, but ultimately they fall into a specific category only. So these chemicals are of acidic or basic nature. Both the types have ill effects on the human body if they come into direct contact with it. These chemicals can create many problems including the burns on skins by acids, and blisters due to the bases or create a burning sensation, which can leave permanent marks on the skin also. To avoid these situations, the chemicals are securely contained in the special laboratory equipments, which hold them safely and allow the people working around to work with them without coming in contact with these harmful chemicals. So it is much helpful for preservation, as well as, safety of people not only working in lab directly, but visiting also. The scientific glassware, which is used in the laboratory, is the best thing to work within the controlled environment of the laboratory. The glassware is good as it keeps the chemicals away from human contact and does not react with any of the chemicals. 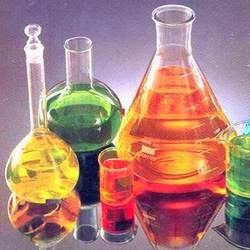 The glassware is manufactured according to the different needs of different chemicals. For containing the highly concentrated acids, the glassware used is very much strong, and of very high quality. • Flask: this is the most common glassware which can be seen in a laboratory. This type of glassware is used to store various types of liquids and is found in a wide range of shapes and sizes. The most common types of flasks used in the operations, in any laboratory are the round bottom flask and the volumetric flask. • Burettes: the burettes are long and contain markings on it, which help the worker to measure the components inside it. They are of cylindrical shape and available in different sizes. Liquids can be easily measured with these burettes, and the readings are very much accurate. • Beakers: these are different kind of containers, which are also very common to find in a chemistry laboratory. These beakers are cylindrical in shape but have considerably more volume than the burettes. The mouth of a beaker is wide open, which helps it to handle the component inside it very easily. • Test tubes: the test tubes are glass tubes, which have cylindrical body and round bottom. These things are used to mix chemicals in small quantities, or to hold chemicals when they are being used in some experiment. Apart from the above apparatuses, there are many things in the scientific laboratory that comes in the category of glassware and are used in various types of works, which are conducted there. The glassware used in the laboratories has to be of very high quality, thus, it is very important to buy from a reputed manufacturer.